If you follow me on twitter or goodreads then you may already know how this mini-review plays out. If you don’t, then welcome. In January I read 12 other books, but then 10 days that existed whilst I tried to read Enchantée I made very slow progress on any books. I really wanted to love this book and the synopsis really dragged me in, however after 80~ pages over 10 days I had to accept we weren’t going to be best friends. Usually I will group my DNF reviews together due to their shortness but as I don’t think this is a bad book I’m pretty happy to let this review exist on its own. My trouble with Enchantée is that I found it too slow. There were a few elements that had been introduced in these pages that definitely held my interest but they just weren’t enough. I wanted to know more about Camille’s magic, I wanted to get to know mysterious balloon boy better, and I wanted to see Camille’s brother get what he deserves (hopefully?). It was just happening too slowly. I really don’t think it helped that January was also a very good book haul month for me so whilst I was struggling through this I had a very enticing book pile encouraging me to dive in. I think when it gets to the point that you’re putting off reading you just gotta accept defeat and move along. As I do believe this book has potential I think its worth you also read a review from someone who finished it and loved it so here is Beths. I also would like to try and rehome my ARC to someone who is super interested in it! I felt the exact same way. I liked a lot about it, but it was so slow! It just didn’t click for me. True. There’s too many 5 star books waiting. I feel even more guilty DNFing arcs though. Ah I’m sorry it wasn’t for you. And yes, when you just don’t want to read because you would have to read that book then it’s time to dnf it. It seems people either love this book or couldn’t get into it. The premise sounds so interesting but I struggled with The Night Circus, so I’ll probably pass on this one. Thanks for the review! I really appreciate your honestyabout the book and your process as a book blogger, thank you for sharing this! It’s a title I have on my tbr and I like to read lots of reviews before deciding to add one…this has given me lots to think about and than ks for sharing another blogger’s viewpoint also! It can be hard to DNF ARCs, so kudos to you. Also I’m glad I read this review. I was on the fence about the novel, but wasn’t sure if I would be into it. Now, I’m almost positive I won’t be. It’s such a shame it didn’t work out for you! It’s on my TBR, but I think I might save it for when I’m in the mood for a slower read. This is disappointing. Not your review but the fact that the book wasn’t what it seemed. I can’t stand slow books, so thank you for the heads up. It’s a shame you didn’t love this, but I understand not getting on with slow books. I need my reads to be action packed! It sounds as thought this needed some rounding out too. Slow books are thought to get through sometimes, love the cover though! I’m sorry this book wasn’t for you, I was really looking forward to reading it but I’ll have to do a bit more research before picking it up. Sorry this book didn’t work out for you. My friend was actually looking forward for this book. And me along with it. I think I should set this book up with my mood when reading. It’s always sad when a book doesn’t work for you, but I know how daunting it can be when you find a book really slow. Great review! It is a shame that you couldn’t get into it! It is definitely much harder when you are surrounded by books that you really want to dive in to. 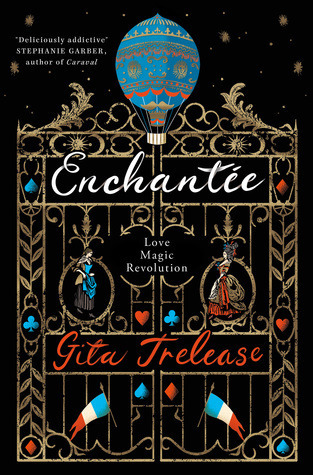 I think I will still give Enchantee a go at some point but I appreciate the heads up on it being a slow read! Ah man! I was so looking forward to this book, the premise sounds so interesting. But I am definitely not in a place where I can read slow books. I just got out of a reading slump and I don’t want to get back in one. I’m sorry this one didn’t work out too well for you! I feel like a LOT of my friends struggled with (or are currently struggling with) it and it makes me feel less bad that I’ve had it on my current-reads shelf for weeks with basically NO progress at all. I’m supposed to post for the blog tour Tuesday, though, so I guess I need to hurry up and finish it. The thing is, I kind of enjoy it so far, but I’m just not motivated to commit to finishing it? Sigh. Sorry to hear that you didn’t enjoy it but thank you for the honest review. I’m so glad I read your review before going out and buying this! I have some patience for slow books if the writing/worldbuilding/characters are intriguing enough, so I think I’ll still give it a chance. sorry it didn’t work for you though, and I hope your next read is better! I am so sorry that this one didn’t work out for you, Lauren! I’ve definitely read books that I didn’t dislike but just struggled with wanting to pick it up, and I’ve set them aside thinking it was a mood thing… but 6+ months later I am still not in the mood so who knows. I hope your next read is better and good luck finding a new home for the ARC!